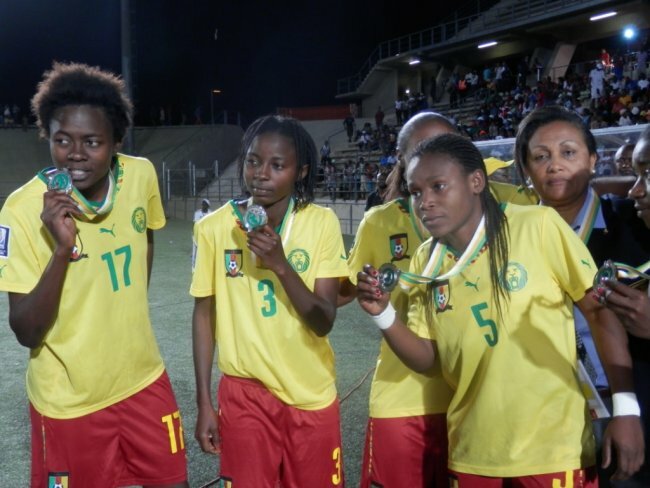 AWC: Cameroon fail to win Nigeria but qualify for the World cup. Nigeria yesterday defeated Cameroon 2-0 to win the African Women’s Championship in Windhoek, Namibia. Nigeria dominated the first 12 minutes until Desire Oparanozie put the Super Falcons in front with a well taken free kick. Asisat Oshoala doubled Nigeria’s lead two minutes from the end of the exciting first half. Cameroon coach Enoh Ngatchu said reaching the World Cup for the first time in a decade can help transform the game in his country. Nigeria and Cameroon had already qualified for next year’s World Cup in Canada by reaching the final. They will be joined there by Ivory Coast who beat South Africa 1-0 in the bronze medal match on Saturday. In an even contest, also played in Windhoek, Rebecca Ida scored the winning goal six minutes from full time. She pounced on a loose ball in the Banyana Banyana box from a corner kick, and slotted the ball home. Indomitable Lion’s Midfielder, Stephane Mbia Etoundi, is the first victim to have a bite of the wrath of angry fans among the 23 players who represented Cameroon in the 2014 FIFA World Cup in Brazil after fans pound on him and vandalised his car. Hours after the Lions returned from Brazil, Mbia was attacked in the Score Shopping Mall at the Yaounde Central Market on Wednesday, June 25. According to reports Mbia, who had purchased a few items from the mall and was about to drive off, was suddenly surrounded by angry looking fans, who were not happy that Mbia was squandering the whooping FCFA 60 million given to each player in prelude to the World Cup after a shameful result. As a result of this, angry fans pounced on him, tore his clothes, vandalised his car.He was safe by the timely intervention of the forces of law and order just when fans were about to squeeze life out of him. However, some faction of the fans were trying to protect Mbia saying that he was only player in the team who put up an perfect performance in the team and should should be spared. Moukandjo was lucky to have narrowly escaped as he passed two hours after the irate fans have scattered. Others suggested that lions’ captain Samuel Eto’o should be the one to go under such a treatment since he was the one that led the team to demand for bonus increase. Meanwhile, some of the players had envisaged such a reception from the population and had to take their various flights to their respective clubs in Europe, instead of coming back home. This explains the reason why out of 23 players who made the trip to Brazil, only 12 players returned to Cameroon. Limbe Stadium, located in Limbe, a southwest coastal city of Cameroon, is a standard-sized stadium with 15000+5000 seats, mainly for football matches and for track-and-field events as well. The central field is designed as per the standard 400m comprehensive track-and-field ground, with a radius of 36.5m and a straight track length of 84.39m, involving 8 main tracks, and 8 straight tracks in the west side. Track-and-field events and natural turf football pitch as per the international standard are included. This project is contracted by China Machinery Engineering Corporation (CMEC) as the prime contractor, and the construction by Transtech Engineering Corporation (China) is commenced from Jan. 2012. The stadium covers a total land area of 162045 m³ and a total construction area of 3813 m³, floor area ratio of 0.06, stand area of 9877 m³, metal rain canopy with an area of 775 m³ and a height of 32.8m; concrete rain canopy with an area of 595 m³. Nigerian star Davido is inarguably one of Africa’s brightest Afro-pop songsters . His new hit dance tune ”Skelewu” is simply phenomenal and getting viral like Azonto. The hit-maker met with ace Cameroonian striker and Chelsea FC new signee Samuel Eto’o during his tour in UK. We keep our fingers crossed for that famous skelewu dance afterEto’o’s first goal with the Blues. NexDim brings to you an excerpt of their meeting. 26-year old Ndmaukong Suh is named as the 14th highest-paid athlete in the world and highest paid athelete in Cameroon’s sports history with a total earnings of $36 million including salaries/winnings ($35.5 million) and $500,000 from endorsements. Ndamukong plays for Detroit Lions in the National Football League (NFL). Ndamukong Suh is the son of Michael and Bernadette Suh. His father moved to the USA from Cameroon Where he met got married with his mother Bernadette , who equally found her way to America from Jamaica. Though an American-born, the native from the North West region of Cameroon has often been vocal of his roots as well as his elder sister and manager Odette Lennon Ngum Suh who played with the indomitable Lionesses of Cameroon at the 2008 African Women’s Championships. Indomitable Lions head coach Volke Finke has unveiled a list of 28 players in preparation for the last World cup qualifiers against Libya in Yaounde. The squad is expected to converge in Paris from August 11th to August 14th. FC Barcelona now coached by Tata Martino recorded its first victory of the season slamming a 7-0 win over Valerenga. Cameroonian striker Jean-Marie Dongou Tsafack made a gamely and prodigious debut scoring two beguiling goals. His career in Cartalan is looking quite propitious. Worth-noting, he joined the team from Eto Foundation. His name features on Volke Finke’s new list of players to confront Libya in the last World cup qualifier in Yaounde. Cameroonian striker Jean Marie Dongou Tsafack might possibly make a movement from FC Barcelona B to team A. He attended his first training session with the team at Ciutat Esportiva Joan Gamper . The 18-year-old forward came to Barcelona in 2008 from Eto Foundation.